Obv. : A VITELLIVS GERMANICVS IMP AVG P M TR P, Vitellius bust, laur., dr., r. Rev. : L VITELL CEN-SOR II / S C (ex. ), L. Vitellius, bare-headed and togate, seated l. on platform on r., r. clapsing hand of foremost of three togate figures before him; behind them, togate figure seated r. Rev. : MARS VICTOR / S - C, Mars, helmeted and in military dress with parazonium at side, advancing l., r. holing Victory, l. aquila over shoulder. Obv. : A VITELLIVS GERMANICVS IMP AVG P M TR P, Vitellius head, laur., r. Rev. : PAX GER ROM / S C (ex. 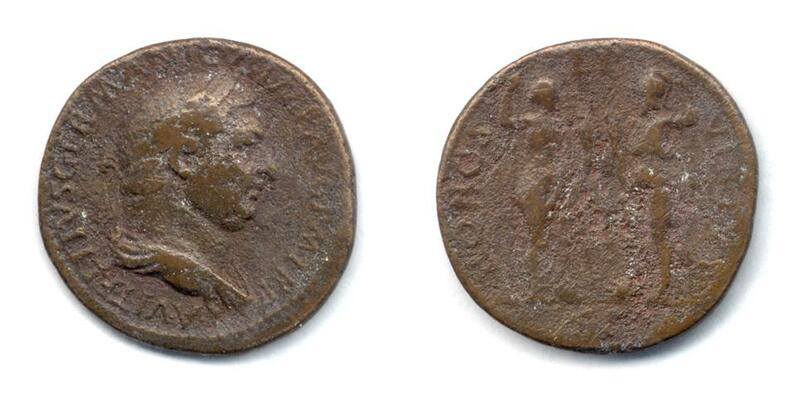 ), Roma seated l., l. leaning on shield, r. offering Victory to Vitellius stg. r., togate, in front of female figure. Rev. : S - C, Mars, helmeted and naked but for cloak, advancing r., r. holding transverse spear, l. aquila over shoulder. Rev. : S P Q R / OB / CIV / SER, oak-wreath. Rev. : VICTORIA AVGVSTI / S - C, Victory, naked to waist, l. foot on helmet, inscribing OB / CIVES / SER in three lines on round shield fixed to palm-tree. Rev. : I O MAX CAPITO (ex.) / S - C, Jupiter, naked to waist, seated l. in tetrastyle temple, r. holding thunderbolt, l. vertical sceptre. Rev. : LIBERTAS AVGVSTI / S - C, Libertas, dr., stg. l., r. holding pileus, l. sceptre. Obv. : A VITELLIVS GERMANICVS IMP AVG P M TR P, Vitellius head, laur., r., globe at point of bust. Rev. : ROMA (ex.) / S - C, Roma, helmeted and in military dress, seated l. on cuirass, r. foot on helmet, r. holding Victory, l. resting on parazonium at side; behind, two shields. Rev. : S - C, Victory, dr., alighting l., r. holding wreath, l. palm.